KidLogger.net is free service that provides monitoring of user activity on computer, Mac or mobile phone. Register now to view user’s activity online at KidLogger.net. 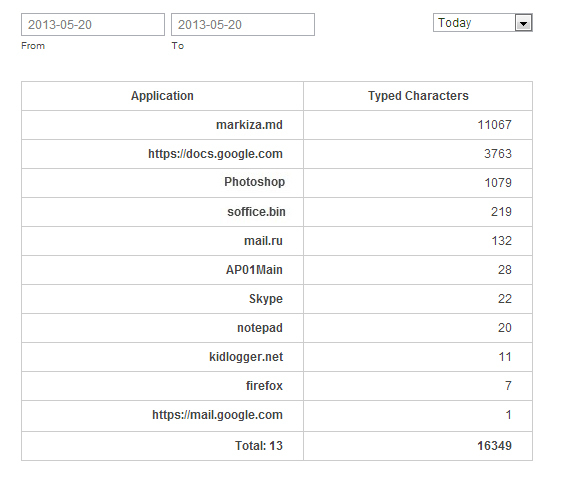 The Activity Log is collected, stored and analyzed online at kidlogger.net server. Register online, login into your account on KidLogger. Download and Install Kidlogger monitoring application on any target computer or notebook, tablet or mobile phone. Open KidLogger > Options > Connect to Kidlogger's account: Enter your email for KidLogger.net and click Connect (test connection). The computer name then will appear in your KidLogger.net dashboard online. Kidlogger records everything on the monitored computer or phone. All user activity logs are sent to your online account. Overview them online from everywhere. Login and monitor your registered devices. Manage them with the help of your Dashboard. You can also enjoy a particularly advantageous analytics that is carefully collected and filtered. Thus, you can save your time and overview accessible activity log. 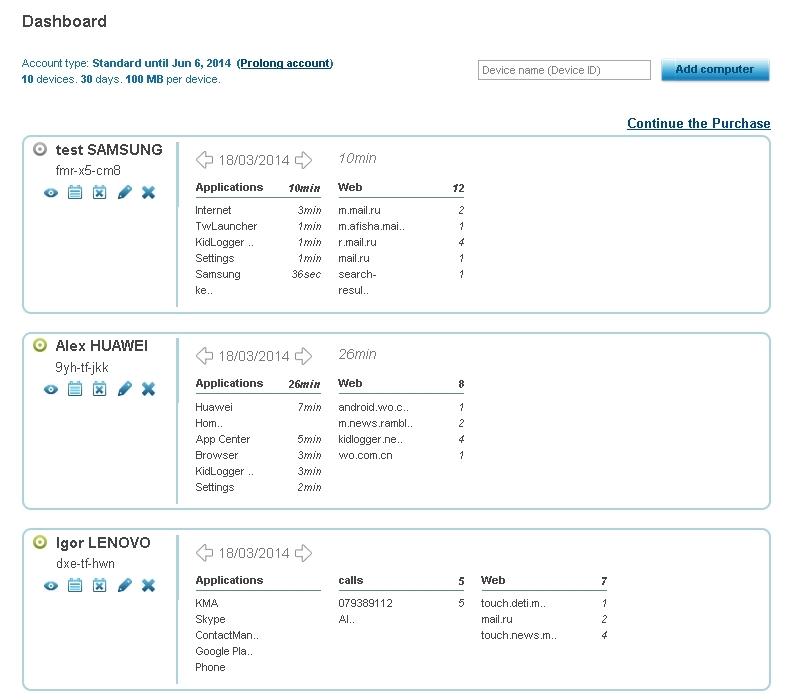 Dashboard - is your operator panel designed to overview all monitored devices: computers, phones, tablets and laptops. Now you can create a new device in your online account. 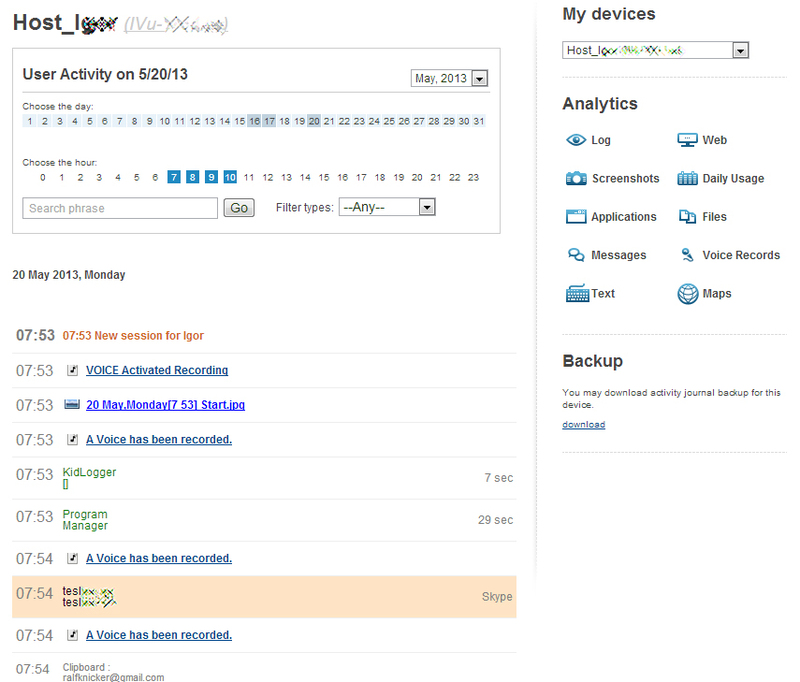 The device ID is generated by Kidlogger server, you only have to fill in the application's options. Dashboard displays a list of computers and mobiles you intend to monitor, control and supervise. Here you can also check for the device status. In a list of devices each of the devices has its own Activity Icon. The Icon is of green color if the user is active, i.e. the device is on and the user is working by it. If the Activity Icon is gray it means that either the computer is off, or the user is not active. You should bear in mind that by default the upload interval is 15 minutes (or less) which guarantees that the Activity Icon will indicate the actual status of the device. If you increase this interval the Activity Icon might give you the wrong status.Dashboard listed computers and mobiles you intend to monitor, control and supervise. Device name (ID) – any of your Windows, Mac or Mobile phone names that you are going to monitor. You may change this name and ID to a simpler one if you wish. Email reports create new report shedule and receive easy-to-use analytics. Analytics shows days in log, hours spent on computer, web surf, keystrokes, launched applications, opened files and folders, conversations (calls, SMS/MMS, Skype chats, recorded calls in *3gp). Screenshots are available for Windows and Mac, Android users can overview taken photos; recorded voices and Skype calls for Windows, calls from Android; Windows and Mac take photos each time you login and out. 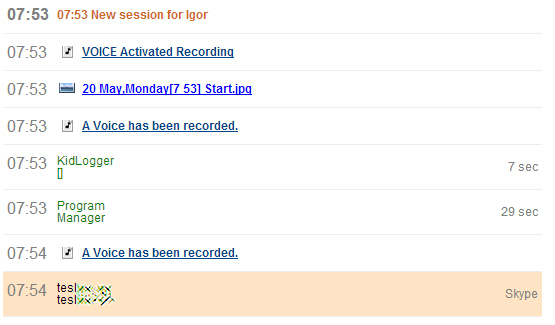 Note: The User Activity table displays idle and active days of the device you monitor. Dates marked with blue squares show the days the targeted computer or phone was on. 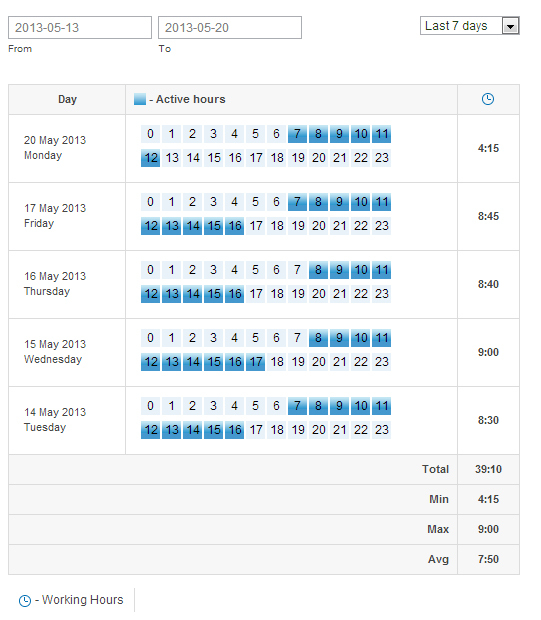 Select any of the marked days to overview Activity Log for this particular day. Below the dates you see the working hours of the device during the day you selected. 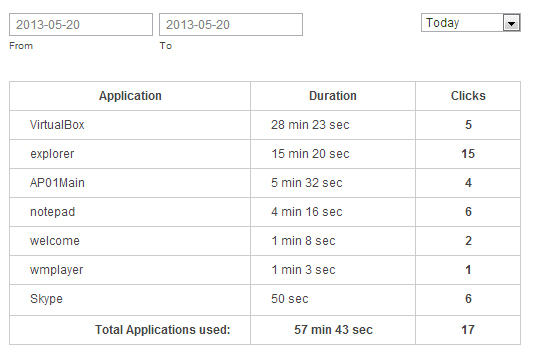 Click any hour to view log data and records. To go through pages of user's Activity data make a few clicks. Search phrase engine will help you to find the targeted log data by introducing the word you are interested in (if available the log requested will appear automatically). Activity Type selector allows to filter records by activity type: Application, Web, Messages, Keyboard, Calls, Media data, Files, Coordinates, System. 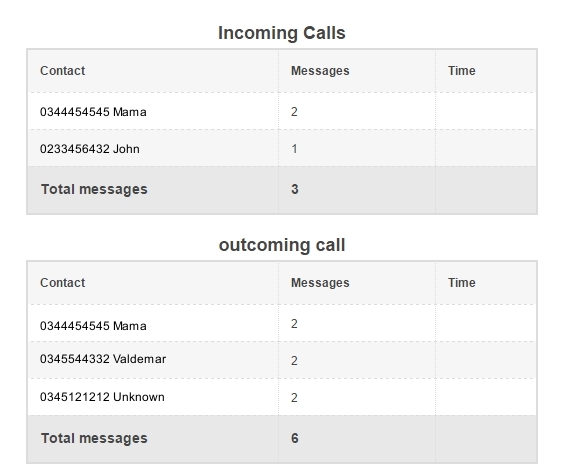 Shows Log received from the device. Any user activity during the day in chronological order. Periodically make screen caputures. The web cam photos of current user, made at the beginning of work. This feature is accesible for Windows and Mac OS, monitoring applications. For Android you can view the taken photos and uploaded photos from the Internet. Process web sites and arrange them in order of most often visited. Displays what user search online in any Internet browser. Shows the time spent on the web site. You can control how many hours in course of the day user works on device. Working days during the month. If the device is on, but not in use the application won’t initialize user activity log. Inactive hours will be blank. You can see the avarage number of working hours, max/min hours of usage. List of applications and duration of use during the working hours on any device. Opened and used files and folders. Files analytics is available for any Windows and Mac. This feature is planed for Android in future release. To overview the texts of IM conversations (e.g. 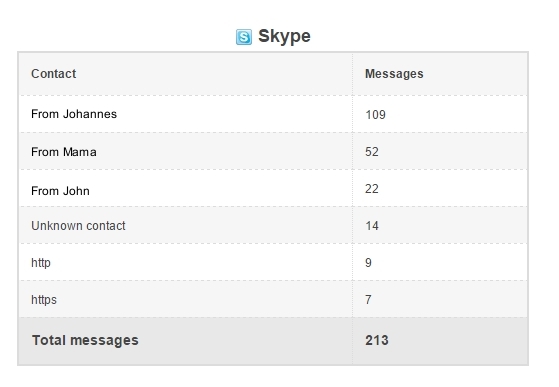 Skype, ICQ, Yahoo messenger, MSN Windows Live messenger), SMS you should select Messages in Activity type filter (Log). The keystrokes typed can be viewed in the Keyboard using the same Activity type filter. 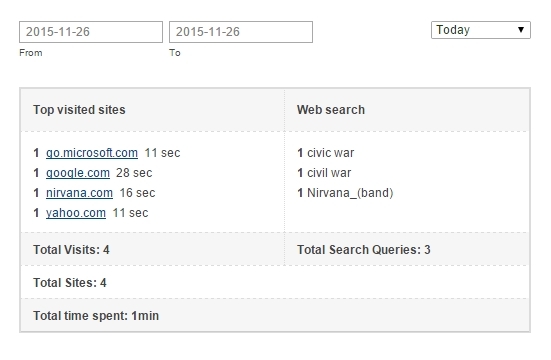 Use search engine to find user activity you are interested in. Record voices near the computers and laptops, Skype calls, phone calls. List of 3gp and mp3 media files. Shows, how many sinbols were typed in different applications. Accessible for PC, Mac, Android. Records GPS coordinates, now you can view step by step movement of the target device. 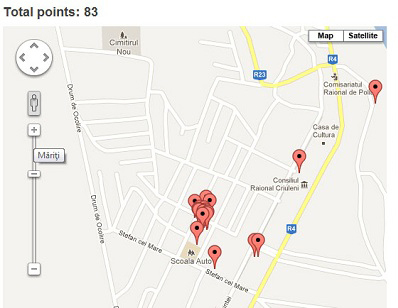 The GPS points are listed in your account, click any to overview it on Google Map. The chosen point takes green color. Your device will use GPS, wireless LAN and cell towers to get accurate coordinates, the way of tracking depends on configuration.